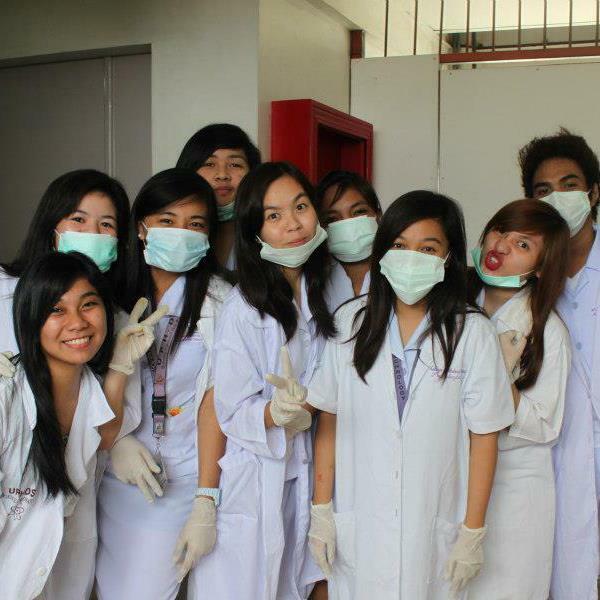 A photo shoot before seeing the cadavers. Within five months this year in our university, those were the exact words that repeatedly stir my ears every now and then. But truth be told, I’m more than glad that the first semester is now over and I am halfway finishing the year 2 of my course. I must say that I have been maturing than ever. I’ve learned a lot from my academics that I tend to apply to in helpful ways. I know this much of a cliche but I’m really grateful to my lecturers for they filled me in with great knowledge and such ideas. Actually, I’ve had this Muslim lecturer in my Sociology and Anthropology class whom I had great admiration (no, definitely not some sort of a crush). She is very smart and has a lot inside of her. She surely is a very effective teacher. And what’s great is that, she is like reaching out to the needy and all that. I always wanted to be in a team like that. And what’s for sure is that I’ll surely miss her, it’s rare to have a professor like her in our course, she’s not just teaching academics, but also touching every student’s heart. For me at least. All semester long, I’ve been consistent with my studies. I’ve been in good grades. I’ve been accpeted to the Medical University News Organization (I mean, how great was that! :D) My love life, (as I have written months ago was a bit scratched) has been doing great. Kirsten had consistent visits and surprises for me, so love life is not to worry about. BUT (yes, there’s always a BIG but) on the latter part of the sem, it seemed that it was raining stress and pressure all throughout. We had this Choral Recitation that certainly hassled me out. I did organize the event and it was quite tiring but in the end all hard works were paid off. Plus I did have the chance to host the event, which was very exciting for me. And again, I’m just more than glad that the 1st sem is over. Well, these are all part of being a student, as my mum always says when I complain about school. I have thought that there are how many more years left for me in school, so why not make the best of it instead. I’ll make it appoint to grab every opportunity in my way. Better be ready for the next semester. For sure it’ll be more like hell. Talk about Physics. This entry was posted on October 19, 2012 at 11:23 AM and filed under Uncategorized. You can follow any responses to this entry through the RSS feed. You can leave a response, or trackback from your own site.